Ohio marijuana legalization referendum rejected; Nick Lachey disappointed. 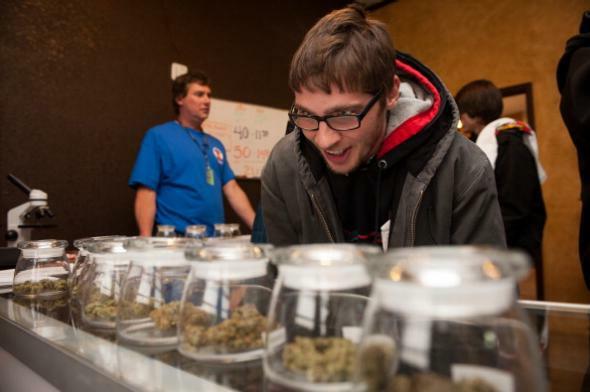 A Blanchester, Ohio, native prepares to purchase marijuana at a dispensary in Denver on Jan. 1, 2014. Issue 3 was unique in the history of the modern legalization movement in that it would have written into the Ohio Constitution provisions to limit the cultivation of the state’s crop to 10 already-chosen properties. Issue 3’s backers said the plan’s advantage would have been to allow the state to tightly regulate marijuana at the grow source. The technical term for such an economic model is oligopoly. But the term “monopoly” got slapped on Issue 3 from the outset, and Issue 3 backers could never run it down. Do you smell that? It’s the characteristic sweet yet pungent odor of democracy in action.